Since the time Luther nailed his Ninety-Five Theses to the church door in Wittenberg, Lutheran theology has survived centuries of political, religious, and societal pressures that challenged its foundational teachings. But this question remains: Do Lutherans today understand their theological heritage well enough to maintain and defend their unique beliefs when outside pressures dismiss them as irrelevant to modern-day Christianity? Check out our Q&A with Rev. Dr. Alvin Schmidt to learn more about him, his latest book, and his passion for teaching others about the Lutheran Church and its historic teachings and beliefs. For the past five decades, you’ve served in various roles, including pastor, professor, author, and speaker. But you were also accepted into Canada’s world-renowned Royal Canadian Mounted Police at the age of 18. What prompted your transition from the RCMP to the ministry? In the 1950s, the RCMP was a highly selective national police force. From thousands of applicants, only a couple of hundred were selected. Its training was rigorous and demanding. The RCMP opened the “other side” of the world to me. By the “other side” I have in mind individuals who, in our society for some reason or another, have not internalized society’s moral values and laws, and so they largely live unto themselves. Thus, when these individuals break the law, it is not something about which they feel guilty. What is important to them is the so-called eleventh commandment: “Thou shalt not get caught.” When they are caught, they are not sorry for what they have done but are sorry that they were caught. This started me to think that perhaps I should study for the Lutheran ministry to try my hand at educating people with the Christian message, rather than being a law enforcement officer. However, when I resigned from the RCMP, I still had not fully decided to study for the ministry. I grew up in a congregation of the American Lutheran Church (ALC). It was the largest Protestant church in rural Manitoba, Canada. After I had resigned from the RCMP, I worked for a couple of years as a building supply representative and called on lumber yards in the entire province of Manitoba. As a traveling sales representative in the business world, I interacted with numerous law-abiding individuals, unlike those in the “other world,” and I realized that they, too, needed a better understanding of Christianity’s message. It was during this time that I finally decided to study for the ministry. In your book, you outline twenty-one important practices, doctrines, and beliefs that distinguish the Lutheran Church from all other denominations. How did you come up with this list? The book has twenty-one chapters, and each chapter highlights and discusses a prominent Lutheran hallmark—Luther’s Small Catechism is one example. Interestingly, in some hallmarks, there is a hallmark within the more prominent hallmark. For instance, in Luther’s Small Catechism, there is Luther’s confident assertion: “This most certainly true.” This statement appears at the end of Luther’s explanation of each of the Three Articles of the Apostles’ Creed, and it is really a hallmark within the Catechism as the more prominent hallmark. Over many years, in teaching Lutheran theology and interacting with numerous pastors and countless laypeople, I have noticed that so many of our fellow Lutherans are not conscious of their church’s distinctive characteristics, its hallmarks. They tend to see the Lutheran Church as just another denomination. Given that this is a false perception, I felt obligated to show how Lutheran theology differs from other denominations. 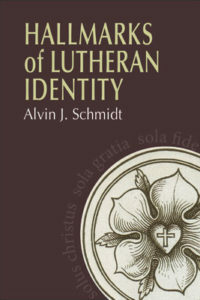 My book calls those differences “hallmarks” of Lutheran identity. If you were to name one hallmark that most differentiates the Lutheran Church from other denominations, which would it be? It is Lutheran theology’s teaching that states God has given us three Means of Grace: His Word, Baptism, and the Lord’s Supper. While most Protestant denominations accept God’s Word as a Means of Grace, they do not see Baptism and the Lord’s Supper as Means of Grace that convey to repentant sinners the forgiveness of sins. What are some of the biggest changes you’ve seen in the Lutheran Church in the past fifty years? How do those changes present opportunities and challenges for Lutherans today? The biggest change in the past fifty years is that Lutherans, especially laypeople, are now largely, and sometimes totally, unfamiliar with Luther’s Small Catechism. This presents a challenge for Lutheran pastors to use the Small Catechism when they instruct adults desirous of becoming Lutherans, a practice commonly not done today. It can also serve as an incentive for pastors to preach on parts of the Catechism, as Luther and countless pastors did after his time. Why is it important that Lutherans understand the things that set them apart from other Protestant denominations? It is important because so many Christian churches (denominations) do not teach everything that is biblically correct. In your opinion, what are the biggest temptations Lutherans face when it comes to thinking that it makes little difference to remain Lutheran in today’s diverse culture? All too many Lutherans tend to say, “a church is a church,” by which they mean there really are no important differences in what is taught and preached in non-Lutheran churches. Why were Luther’s theological ideas so ground breaking in his time? Luther’s theological ideas were ground breaking because for the longest time (really for centuries) the church’s priests, bishops, and popes no longer taught people the biblical basics. The concept of faith, for instance, was unknown to the people and to the priests, as well. And as Luther discovered in 1528 as he visited parishes in Saxony, not only were the people ignorant of basic biblical teachings, but so were the priests, for many did not even know the Lord’s Prayer. It was this biblical void that prompted Luther to write this Small Catechism. Second, given the pervasive presence of multiculturalism and political correctness in our society today, I pray that no reader will think it is narrow minded or bigoted to believe there is no salvation outside of Jesus Christ. Christians often have to be contra-cultural and not let themselves be influenced by our culture’s many anti-Christian beliefs and values that today define believing there is no salvation outside of Christ as bigoted. Third, I hope every Lutheran reader will seriously and consciously try to identify with the Lutheran hallmarks discussed in the book, for they all reflect biblically based teachings. To order Hallmarks of Lutheran Identity, visit cph.org or contact CPH at 800-325-3040.